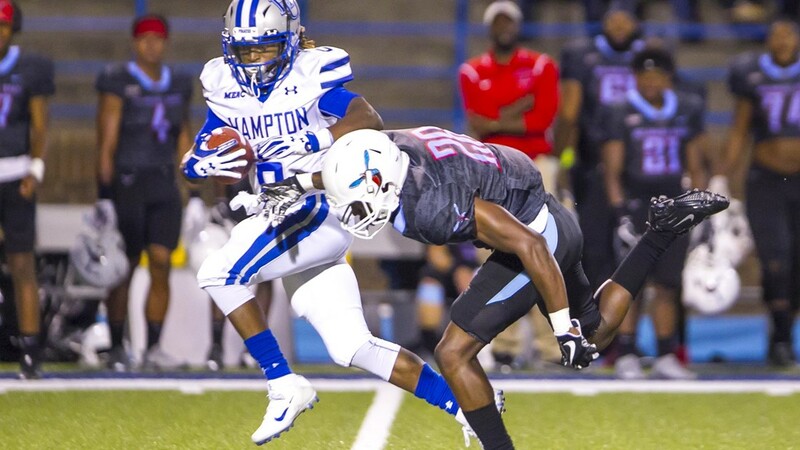 HAMPTON, Va. – Delmon Williams threw for 305 yards and three touchdowns, while Aulden Knight caught four passes for 172 yards and two scores as Hampton opened its 2017 Mid-Eastern Athletic Conference slate defeating Delaware State 28-15. The Hornets stung first on the board forcing a safety as their defense pinned Hampton inside its five. A punt snap sailed out of the back of the end zone and put the Hornets up 2-0 with 9:31 left in the first quarter. Delaware State pushed the advantage to 5-0 on its ensuing possession going 63 yards but stalling on the Hampton nine for a 26-yard field goal from Wisdom Nzidee with 3:54 left. Hampton found some offensive traction in its next drive going 77 yards in nine plays. Williams was 4-of-4 on the drive hitting Yahkee Johnson for 21 yards, Wesley Wolfolk for four and a pair of completions to Ronald Bell. The first one went for 38 yards down to the DSU three, while two plays later he connected with Bell on a four-yard pass to lead 7-5 with three seconds left in the opening quarter. The start of the second quarter saw both teams score on their first possessions. Delaware State (0-2, 0-1) went 60 yards in nine plays as quarterback Jack McDaniels scored on a one-yard run to put the Hornets up 12-7 with 10:19 left. Hampton responded with a quick strike as Williams and Knight connected on a 48-yard scoring pass to take the lead again at 14-12 barely 40 seconds later. The Pirate defense stepped up late in the quarter after a blocked punt, Delaware State took over on the Hampton 15. After three running plays put the Hornets on the Hampton four, the defense stiffened and forced a 19-yard field goal from Nzidee to put the Hornets back on top 15-14 with 3:59 left. Much like DSU’s last scoring drive, Hampton responded very quickly as the tandem of Williams and Knight connected again on a 78-yard slant route that put Hampton up 21-15 21 seconds later. After a scoreless third quarter, Hampton scored its final touchdown on a six-play, 71-yard drive as Johnson finished with a 15-yard scamper. Williams and Knight were large again on the drive connecting on a 35-yard pass to get Hampton down to the DSU 20. Johnson topped the team in rushing with 86 yards on 15 carries, while Bell added a team-high six receptions for 89 yards and one touchdown. On defense, Raheim Huskey and Steven Smith Jr., shared the team lead with 11 tackles each. Hampton outgained Delaware State 439-267. The Pirates return to action on September 16 at 6 pm when they host Livingstone College for Alumni Day and City of Hampton Day. Delaware State travels to West Virginia next Saturday.